This time last year a very nervous and hairy man decided to pick up a compact camera an make an introduction video and post it to YouTube. This very shaky and tinny video that still remains online to this day was the start of a very addictive hobby that has helped me in many ways. I would like to thank everyone who has reached out to comment on my videos, share my videos, like/hate my videos and have been able to watch these videos even when they was cringe worthy. I would also like to thank everyone who has added me on Facebook, twitter, WordPress, YTTalk and all the other social networks I like to ply my trade. In the last 365 days I have made some wonderful friends and subscribers who have helped me in more way than they may realise. Making my YouTube videos in the last year have been a way for me to grow as a human being, to release my frustrations and to learn to be myself even when I feel blue. In the last 12 months I have been blessed with such wonderful comments and assistance from so many people even when I’m boring you with what food I am cooking or what hideously cheesy film I want you to watch. Once again THANK YOU. THANK YOU if you’ve taken part in the #HairyMovieClub. 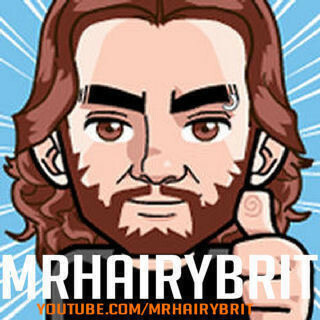 THANK YOU if you’ve sent me messages on videos, Facebook or twitter, and THANK YOU for watching my videos even if you are brand new to my madness and you’ve only just started to laugh at my hairy face. I will continue to share the insanity that is in my head for as long as you wish me to.